From Junction 11 of the M27 take the slip road down to the roundabout. (Delme roundabout). Take the 4th exit into Wallington Way – signs for Wickham and Alton. At the next roundabout you will see a Sainsburys superstore. Take the 2nd exit then go straight across the mini roundabout. The Hall is ¼ mile up on the right, past Poundland. 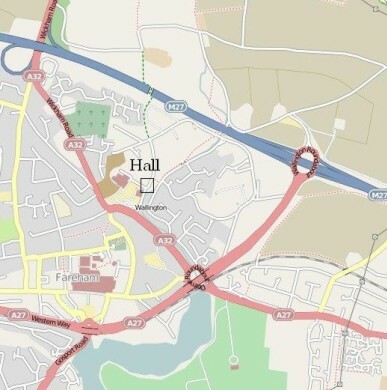 For users of SatNav systems the postcode of the hall is PO16 8ST.